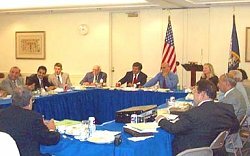 Leaders of Mideast Christian organizations in the United States formed a national conference to be known as MECHRIC (Middle East Christian Conference) on June 28. The new conference will raise the profile of the concerns of the various Christian communities in the Middle East. The announcement was made at a meeting convened at the US Capitol by the Washington-based Freedom House�s Center for Religious Freedom and US Senator Sam Brownback, Chairman of the Foreign Relations Subcommittee of Near Eastern and South Asian Affairs. Meeting participants included the American Coptic Association, US Copts Association, Arabic Baptist Church, Assyrian Academic Society, International Coptic Federation, Christian League of Pakistan, American Maronite Union, Assyrian Universal Alliance, Beth Nahrain National Organization, South Sudanese Voice for Freedom, World Lebanese Organization, Iranian Christian International and Chaldean National Federation. Also attending was a representative of Maronite Patriarch Sfeir. Participants noted the lack of US response and unbalanced policy approaches to the problems of Mideast Christians.